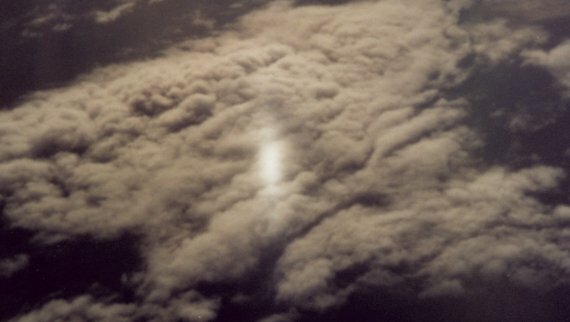 Photo of the Week.. Sunlight reflected from ice crystals in clouds create a billiant "subsun." Astronomy news for the week starting Friday, February 15, 2002. The Moon grows through its crescent phase the early part of the week, and reaches its first quarter on Wednesday the 20th well after moonset for the Americas, the closest view to the actual quarter taking place the night of Tuesday, the 19th. Look for a nice configuration with bright Mars the night of Saturday, the 16th, the crescent Moon passing five degrees to the south of the red planet. Mars is practically on the ecliptic (the apparent path of the Sun), while the Moon will be about as far south of the ecliptic as it can get. The real match-up of the week, however, involves the Moon and Saturn, as the ringed planet takes a direct hit the night of Wednesday the 20th, the Moon just past the quarter, which means that Saturn will disappear suddenly behind the nighttime leading eastern lunar edge. The times of the occultation vary across the continent. The event is best viewed in the east, where it takes place in full darkness. The west coast unfortunately loses out as Saturn is covered during daylight. In New York and Chicago, Saturn respectively disappears at 7:25 and 6:05 PM local time (the latter in twilight), and reappears at 8:43 and 7:14. The central path of the occultation lies more to the south, however. In Atlanta, the times are 6:55 and 8:26, while in Dallas they are 5:30 and 6:56. While lunar occultations of planets are pretty, they are of little professional interest. Those of stars, on the other hand, are avidly observed, as we can use them to determine stellar diameters, and even the presence of close companions. Even if you miss the occultation, the juxtaposition of Saturn with Taurus's Hyades is always well worth a look. Some 30 degrees to the east of the Saturn shines brilliant Jupiter, which is nicely set into Gemini. With Saturn moving to the east against the background stars and Jupiter still moving slowly westerly, the two planets draw ever so slightly closer together, a situation that will not last, as Jupiter will reverse itself about the end of the month. Little Mercury, which has been in hiding for some time now, makes an early morning appearance, though because of the flat angle of the ecliptic to the horizon, not a very good one. The little planet reaches maximum western elongation relative to the Sun the morning of Thursday, the 21st. Cassiopeia and Ursa Major, with their prominent respective "W" and Big Dipper, circle the north celestial pole like opposing hands on a giant clock. As Cassiopeia now descends into the northwestern sky, watch for the rising of the Dipper, which in mid-evening magnificently stands upon its bright handle. To the south in early evening shine the winter stars, dominated by wonderful Orion, the Hunter, the bright constellation surrounded by his grand retinue.